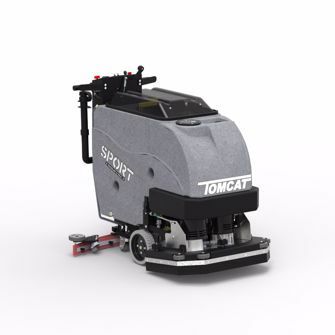 Tomcat’s Sport floor scrubber was designed to be simple and compact while not holding back on power with an American made motor. It would make a great addition to just about any facility – school systems, healthcare, warehouses, grocery, retail, airports – and it fits in your supplies closet! The Sport is available as a Pad Assist or Traction driven machine. The Traction drive is slightly easier to drive than the Pad Assist. This commercial scrubber can clean up to 2.5 hours continuously and allows you to choose from three different scrub head types, all with different features and benefits. Disk – Gives you the option to choose between a brush or pad, has the lowest maintenance cost, improves cleaning on uneven floors, and individually driven brushes enhance performance. Cylindrical – Has superior grout cleaning abilities, it can scrub and sweep simultaneously, and eliminates dust mopping. EDGE – mainly used for maintaining and stripping floors (without chemicals), reduces slip & fall potential and boasts a 70% reduction in water usage. Machine Control Panel – switches are marine-duty and there are universal icons to streamline training. Vacuum Muffler – consistently achieves 72 dBA. Squeegee Adjustments made with wing-nuts means you don’t need tools to maintain the 4-sided squeegees! Front Fill System – includes a stainless steel screen so debris isn’t allowed in. Scrub Path Width: 17", 20" and 26"
Dimensions: 45" x 21" x 39"
Scrub Path Width: 20" and 24"